Thank you for your interest in Atlanta Metropolitan State College to continue your education. 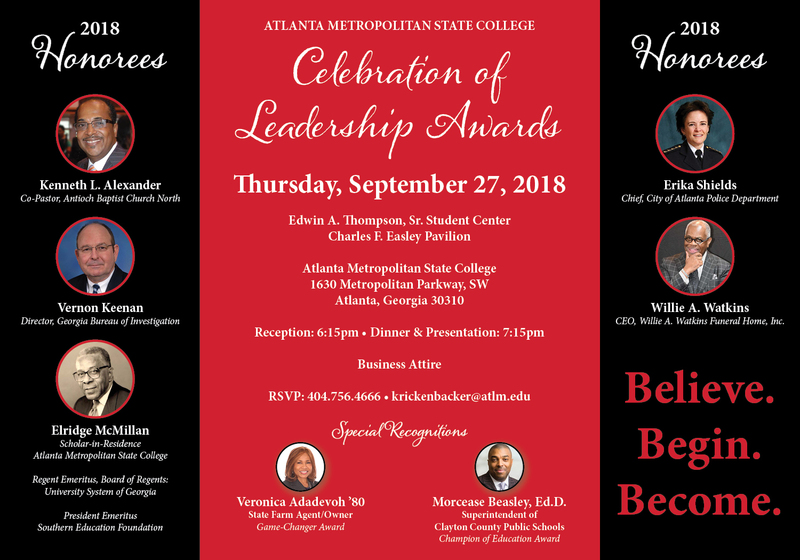 The Mission of the Admissions Office is to support the educational purpose and institutional values of Atlanta Metropolitan State College. In carrying out this mission, this office is committed to the goals and beliefs of the Institution and the Division of Student affairs and strives to serve the diverse and changing needs of the campus community by capturing, preserving and providing information in a manner consistent with ethical and legal standards. Post Baccalaureate - Applicants who have earned a Bachelor's Degree or Higher from a regionally accredited college or university recognized by the University System of Georgia and will not be working toward another degree. Dually Enrolled - Move on When Ready, Early College, and Joint Enrollment - Applicants who are currently in high school and wish to earn both college and high school credits. 1. An official high school transcript with graduation date. 2. GED test scores along with high school transcript if graduated within the last 5 years. 3. For early consideration, an official high school transcript with completion of first semester of senior year may be submitted. 4. An official transcript from all regionally accredited institutions and colleges. 5. Documents submitted from schools outside of the United States will need to be evaluated by an independent professional evaluation company. 1. MMR1 and MMR2 - Required for all applicants born in 1957 or later. MMR (Measles, Mumps, Rubella). 2. Tetanus-Diphtheria - TD booster dose in the last ten years of primary series with DTaP, DTP or Td. 3. Varicella - Required for all applicants born in 1980 or later and for all foreign born students regardless of year born. Either a history of chicken pox, a Varicella antibody, or two (2) doses of vaccine given at least one month apart if immunized after the age of 13. 4. Hepatitis B - Required of all applicants who are 18 years of age or younger at time of enrollment. 3 doses require. Immunization statements must be completed and verified by a physician. PLACEMENT EXAM Although Atlanta Metropolitan State College does not require SAT or ACT scores as criteria for admissions, applicants who meet the following criteria should submit scores to be exempt from taking the ACCUPLACER Placement Exam. SAT/ACT Test scores must be from a national test administration and less than seven (7) years old. - If you graduated from a Georgia high school on or after May 2010 with a minimum English Language Arts (ELA) score of 235 on Georgia High School Graduation Test, this score will exempt you from taking the ACCUPLACER Placement Exam in English and Reading only. - Transfer in English 1101 or College level Math from an accredited institution. - If you have taken the ACCUPLACER Placement Exam at any University System of Georgia institution or Georgia Technical School from which you have matriculated, your scores are transferable to Atlanta Metropolitan State College if received on official letterhead PRIOR to registering for the ACCUPLACER at Atlanta Metropolitan State College. The fee for the ACCUPLACER Placement Exam is $20.00. The ACCUPLACER Placement Exam is administered at specific times before and during the General Registration period. If you have further questions contact The Office of Testing Services located in Academic Building 500, Room 217. For more information on testing visit their website at http://www.atlm.edu/students/testing-services.aspx. The Board of Regents of the University System of Georgia now requires all applicants to provide proof of Lawful Presence in the United States in order to be considered for In-State resident tuition fees. This change is effective immediately for ALL applicants. * BOR Policy 4.3.4: Each University System institution shall verify the lawful presence in the United States of every successfully admitted person applying for resident tuition status (in-state tuition), as defined in Section 7.3 of this Policy Manual, and of every person admitted to an institution referenced in Section 4.1.6 of this Policy Manual. - Your completed FAFSA for the current financial aid year. Lawful presence can be determined through this process. Atlanta Metropolitan State College school code for the FAFSA is 012165. - Your certified U.S. Birth Certificate showing that you were born in the U.S. or a U.S. territory. A photocopy/fax is NOT acceptable unless the original has been reviewed by AMSC staff. - Your U.S. Certificate of Naturalization (USCIS form N-550 or N-570). A photocopy/fax is NOT acceptable unless the original has been reviewed by AMSC staff. - Your U.S. Certificate of Citizenship (USCIS form N-560 or N-561). A photocopy/fax is NOT acceptable unless the original has been reviewed by AMSC staff. - Your U.S. Certificate of Birth Abroad issued by the Department of State (DS-1350) or a Consular Report of Birth Abroad (FS-240). A photocopy/fax is NOT acceptable unless the original has been reviewed by AMSC staff. - Your current U.S. Passport. A photocopy/fax is NOT acceptable unless the original has been reviewed by AMSC staff. - Your current, valid Driver's License issued by the State of Georgia after January 1, 2008 and issued for more than two years. Your current, valid ID issued by the State of Georgia after January 1, 2008 and issued for more than two years. 4. Scroll down to "Processed Application" and click on the hyper-link semester. All students who are admitted to Atlanta Metropolitan State College will receive an official Acceptance Packet. The packet will contain your acceptance letter along with an invitation to New Student Orientation. New Student Orientation is required of all new students. You may use the invitation in your acceptance packet or follow this link to RSVP . At New Student Orientation you will hear more about the expectations of being a student at AMSC, meeting with an advisor and selecting courses. Registration is not complete until full payment is made. Tuition and Fees will vary depending on the number of courses you register for. During registration, financial aid counselors and personnel from the Office of Fiscal Affairs will be available to assist you with settling your account. PLEASE NOTE: Receiving Financial Aid does not guarantee that tuition and fees are covered at 100%. For a complete break-down of tuition and fees, please visit their website at http://www.atlm.edu/students/student-accounts.aspx. You can submit your FAFSA online at www.fafsa.gov. The school code is 012165. It is recommended that you use the â€œIRS Data Retrieval Toolâ€ when completing the income portion of the FAFSA. You and/or your parents may be required to submit Federal tax transcripts to the Office of Financial Aid. You can request IRS Federal Tax Transcripts from the IRS at 1-800-908-9946 or online at www.irs.gov. Copies of income tax returns from your tax preparer or yourself, if self-prepared, are not acceptable. For additional information concerning Financial Aid visit their website at http://www.atlm.edu/students/financial-aid.aspx. Atlanta Metropolitan State College does not offer housing on its campus. It is each studentâ€™s responsibility to find housing. If you require assistance, please call the Office of Student Activities at (404) 756-4485. Or visit their website at http://www.atlm.edu/students/housing-information.aspx for more information. If you require additional assistance, please contact us via email admissions@atlm.edu. When communicating via email, please type Admission Question on the subject line to receive a faster response. Make sure to include your name and AMSCID number.